The 44 and 45 calibers were the most loved during the days of the cowboys due to their excellent ability to protect people. This reputation continues today in the use of the 45 ACP. Invented in 1906 and appearing on the market alongside Colt's new semi-automatic M1911. This round and handgun quickly swept across America and became some of the most popular products in the States. Officially existing since 1855, Colt is one of America's oldest and most revered firearms and ammunition manufacturers. 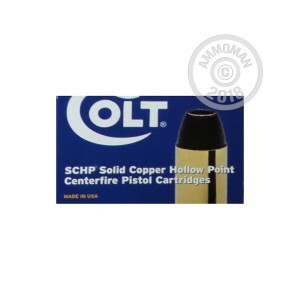 When you grab these solid copper hollow point rounds to defend your family with, you are getting the quality only Colt can provide. With these expanding, 185 grain rounds, you have the stopping power, energy release, and terminal performance you need to protect yourself. Not sure yet; have only fired 20 rnds so far. Had to switch from a 17 lb Wilson flat recoil spring to a Wolf 15.5. The primers still flatten out showing high pressure. I have tried to communicate with the mfg. (GBW Cartridge in Venice Fla), but can't seem to get any answer - The phone seems to ring busy any time of the day. Need to use an 18.5 lb recoil/heavy FP sping. Will try in a couple of weeks and get back with you. Nice hot load. Expansion is probably awsome. I recently ordered 400 rds of this ammo. First of all I was totally impressed with the rapid delivery time and the good packaging in which all of the products arrived securely and intact. Let's get to the ammo. It is packaged in 20rd boxes, 10 boxes per case. The box claims 1050fps not 1100 as the ad states. This is a negligible difference however as there is more than enough punch to do the job. I ran 60rds through my Colt Government without a hiccup. Shot a 2 1/2" 5 shot group at 15 yds, penetrated 2 -1/2 gallon jugs of frozen gelatin at 15yds resulting with a 3" exit hole in the 2nd jug and complete "flowering" of the hollow point. Two thumbs up, I will be ordering more of this soon.